This collection includes handouts and web resources to share with parents in support of reading at home. There are also great tools to use in classroom projects students can create as part of a reading activity. Be sure to read "In the Classroom" portions of reviews for loads of ideas. Invite parents to see the projects online so your students can revisit them and reinforce learning at home. Reading is everywhere! The focus of this site is to encourage better literacy and reading enjoyment among pre-teens and adolescents. A sister site to Reading Rockets and Colorin'Colorado, Adlit offers summer reading strategies, book lists, book clubs, classroom technique hints which encourage development of reading attack skills, and a special section on authors and their best books. For a Spanish language version of the main topics available as an A to Z list, click on the left side of the screen ( En Espanol ). 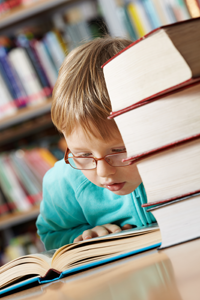 This site has everything you already know about teaching reading in easy-to-use formats. This site requires Flash and Adobe Acrobat. Get both from the TeachersFirst Toolbox page. If you need ideas to get students reading for fun and to help develop their confidence, try this site. Highlight this on your class website so parents can try the activities with their older students. When doing author biographies, share this site with your class using an interactive whiteboard or projector. Be sure to check out the "Classroom Strategies" link for even more literacy ideas. Weekly printable Hunt the Fact Monster activity sheets encourage students to build research skills and internet literacy as they use the Fact Monster search engine to find the answers to the questions in the activity. There are separate sections for grades 2-3 and grades 4-8. This site requires Adobe Acrobat Reader. Get it from the TeachersFirst Toolbox page.. This site can be used for individual students, in a technology class, or as a parent-and-student together assignment. Be sure to see the Ideas for Using Hunt the Fact Monster in Your Classroom page for tips on using the hunts in your classroom. Before you launch your research project with younger students, use this exercise to solidify research basics or as a pretest to be sure everyone is ready. Challenge your more able students to create their own Fact Monster hunts on individual research topics and share them with classmates. Reading teachers can also use these activities to help students practice skimming and scanning. This site, chock full of links to interactive sites, sends the student to activities according to the guided reading levels used in their primary classrooms. Mrs. Cassidy, web creator of Browser Books (accessed by clicking link on this homepage), encourages parents to promote literacy by allowing their child to try the activities at home. Skills learned at each level will be reinforced by playing the games linked through the color-coded tab. Teachers, click on the "Note to Parents and Teachers" link below the home page title. Mrs. Cassidy explains her log-in system for her classroom. This system rewards better reading and advanced games and activities by encouraging the student to advance through a color-coded system. You may want to duplicate this practical system. A word of warning: You may want to tell your primary child that "colour" isn't misspelled, according to Canadians (British English). This site, a companion to a print book, focuses on ideas and activities for book clubs, including short summaries of books, recipes, and activities paired up with featured books. Books included are of many levels and genres, all of high interest for children. Children's authors write some of the book reviews; book club members are welcome to list their book club, book descriptions, and activities on the site as well. Links include an author section with a comprehensive list of authors who will speak to your book clubs by phone and authors and illustrators willing to visit your school. Find food ideas and activities to promote reading on this site! Mention this site to your school librarian for use with school book clubs. FCS teachers may want to coordinate some of the recipes with books featured in language arts class. Parents would appreciate the link on your teacher web page or newsletter so they can encourage reading at home. Your school parent organization can find great ideas, as well. Make this link part of your family literacy treasury. This 3-in-one online magazine for elementary to middle school kids has attractive graphics, sound, games, news, e-cards, etc. and serves as a companion to paper magazines at three levels: Chirp, Chickadee and Owl. The Owl magazine for upper elementary to middle school is includes an online calendar with moveable stickers, word searches, jokes, a mystery in graphic novel style, and features including international, gender, and environmental awareness. All three magazines promote reading and get children into the habit of "looking" at a magazine for fun, news, and information. This site would be a good one for students to learn the literacy skills of surveying a site to see how it is organized (just as they should do with a textbook).Whether or not you have these magazines in "hard copy" in your classroom, you can generate excitement about reading by sharing the activities on these accompanying websites. Then include the link on your teacher web page for students to explore from home or during free time. The Parents and Teachers Resources section is still under development. Children can submit their own artwork to be displayed at these sites! (Make sure you have parent permission). Shel Silverstein's outside-the-box style of poetry has delighted students for years. Now, his website extends that wacky literacy to another medium and level. You may be tempted at most sites to skip the intro. Don't skip Shel's. Familiar entities walk across your screen welcoming you. Screen Savers, animated Shel-creature-people to enjoy, reproducibles, and more await your enjoyment. Click on Poetry Month to find more activities and games that you can use during April. Your students will chuckle at Shel's own reading and lively animation of several of his poems. This is a site to explore with your class. Take your students on this language-rich adventure using an interactive whiteboard or projector. Mark your calendar now to visit this site during April, when Poetry Month is celebrated. Download your free poetry kit from the poetry month link. Of course, Shel Silverstein's whimsical and slightly dark humor can be enjoyed any month. There is a link for Teachers and Parents with lesson ideas, printables, and more. This is a great site to share with parents and students for summer breaks. This Houghton-Mifflin site offers leveled reading of suggested trade books and authors biographies. After selecting your state, click Reading and find resources for Kids and Additional Spelling Words, also about Aurhors and Illusrators. Also, on your grade level page are several Themes and additional resources. Strategies are also provided to assist in teaching phonics, whole language and early intervention. Check out this great resource for teachers, librarians, parents, and principals. Use this website as a resource for your classroom, library, or even with you school action committees. Provide a link to this site on your class web page. Suggest this site to parents to help their children with reading by including the link on your teacher web page or in a newsletter sent home. You might want to share the list with your school librarian in case children ask for the books.